During summer season, it’s common for some people to taste a cool and delicious food including ice cream, lemonade and other sweet fruits. But in the Ozarks region, many of the people prefer to taste the freshest farm products such as homegrown tomatoes, beans, cucumbers, lettuce and peppers. Not everyone has the capability to grow their own vegetables, but with accessibility to a couple of farmers’ markets in the Branson area, many of the residents and visitors can have all the summer goodness. On the summer months, you can pick out some of your favorites at Branson Landing or College of the Ozarks. Farmers Market of the Ozarks at Branson Landing offers a unique shopping opportunity where you can enjoy farm-fresh produce, preserves, meats, florals, art and music. The Farmer’s Market is seeking vendors who are interested to participate in “the fastest growing market in the state.” The market is located on the south end of the Branson Landing parking lot. The market event will start in September and runs through October, and opens every Tuesday from 3 to 7 pm. The objective of the Farmers Market in Branson is to improve the financial success of farmers across the Ozarks, through a well-structured market, which in turn, able to create increased sales of the crops producers grow. “We want unique, handmade, and locally grown products to meet the demand of the community,” FMO executive director Lane McConnell. There will be a community meeting to be held sometime in August at the Branson Convention Center from 6 to 8 pm for the public to learn more about the upcoming market event in Branson Landing. 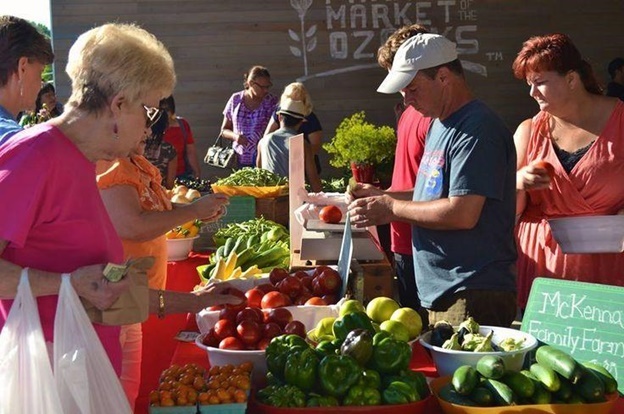 Farmers Market of the Ozarks offers consumers a full-range of locally grown farm products which include vegetable, fruits, pasta, meat, jellies, jams, salsa, cheeses, eggs, yogurt, baked goods honey, artisan crafts and an array of food vendors. This marketing event at Branson Landing operates a vibrant farmers market which contributes to the success of local food growers and producers, making the local food economy look stronger and serves as a gathering place of a community in the Ozarks region. The director of marketing for Branson Landing Tammy Scholten has said that they are excited about this new partnership with the Farmers Market of the Ozarks, as it gives people the opportunity to enjoy unique shopping and experience the amazing and plentiful offerings directly available from the farmers and artisans of the Ozarks. The new partnership with Farmer’s Market of the Ozarks and their expertise in improving the financial success of local farmers across the Ozarks, will provide a handmade and locally grown products to those living in the community, as well as visitors to Branson Landing and the Branson area. According to American Farmland Trust, if you spend $10 at a farmers market, $7.80 of that will be re-spent in the community, supporting jobs and businesses. This means that farmers market in Branson will help strengthen its local economy even more with local shopping.